Whether you need a neon sign fabricated, repaired and/or installed for your business, the experts at Greenfield Signs & Lighting are here to help. We offer custom neon signage design, fabrication, installation and repair services for businesses throughout the greater Indianapolis, Indiana region. For many years, our team has provided countless customers with the business and corporate signs they need to gain an edge on the competition. There are many benefits to selecting neon signs. For starters, illuminated neon signs have proven to be an effective advertisement tool for businesses for many decades. Put simply, neon signs will attract attention to your business – exactly what you’re aiming for with a custom illuminated sign. 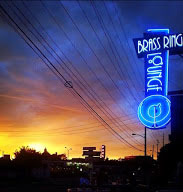 In addition, neon lit signs are renowned for their visibility and unique appeal. When the sun goes down, an unlit sign fades into the shadows, but with a custom neon lighted sign, it will be your company’s turn to shine. Neon signs are especially popular with companies that do a lot of business at night, such as restaurants, clubs, bars and other establishments, but can also draw attention to your company even after hours, helping you draw in prospective clients even during the off hours. Best of all, there are countless shape and design options, so you can really use your imagination when designing these versatile signs. To learn more about how neon signs can be an asset to your business, call our team today at 317-469-3095.